The Alps (German: Alpen; French: Alpes; Italian: Alpi; Slovenian: Alpe) are a great mountain system of Europe, forming parts of nine nations: stretching from Bosnia and Herzegovina, Croatia, Austria, and Slovenia in the east, through Italy, Switzerland, Liechtenstein and Germany to France in the west. However, only Switzerland and Austria can be considered true Alpine nations. The highest mountain in the range is Mont Blanc, at 15,774 feeet (4,808 meters) on the French-Italian border. 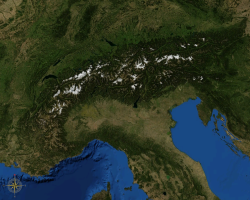 The highest and most densely settled mountain belt of Europe, the Alps occupy an area of approximately 80,000 square miles (200,000 sq km) and are home to some 20 million people. The word "Alps" was taken via French from Latin Alpes (meaning "the Alps"), which may be influenced by the Latin words albus (white) or altus (high) or more likely a Latin rendering of a Celtic original. The mountains contribute much of what is left of the original forest cover of central and southern Europe. Some of the continent's last remaining forests of a most natural state are in the Alps ecoregion. Home to a high level of biodiversity, the popularity of the area's winter resorts and its increasing population threaten this. The tapestry of the Alps—its beauty, unique culture and diversity of wildlife—contribute greatly to Europe and the many nations this range traverses. Glacier de Taconnaz in the French Alps with Dome de Gouter. The Alps are a classic example of what happens when a temperate area at lower altitude gives way to higher elevation terrain. Elevations around the world which have cold climates similar to those found in polar areas have been called alpine. A rise from sea level into the upper regions of the atmosphere causes the temperature to decrease. The effect of mountain chains on prevailing winds is to carry warm air belonging to the lower region into an upper zone, where it expands in volume at the cost of a proportionate loss of heat, often accompanied by the precipitation of moisture in the form of snow or rain. 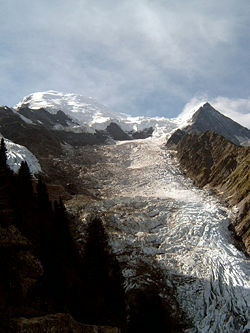 Several glaciers are located in the Alps, the longest of which is the Aletsch Glacier in the Bernese Alps. They may be found in all of the higher groups of mountains from the Dauphiné Alps in France to the Hohe Tauern in central Austria, and the main ascent routes on many of the highest mountains pass over glaciers. 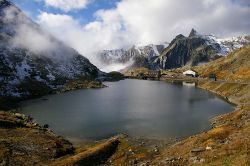 Very few large lakes are found within the body of the Alps, but a number are situated around the edge, particularly in areas formerly covered by glacier tongues. These include Lago Maggiore, Lake Como and Lake Garda on the southern side of the Alps in Italy, and the lakes of Switzerland, southern Germany and the Austrian Salzkammergut in the north. Po: Oglio, Adda, Ticino, Dora Baltea. Other important rivers draining the Alps include the Var, Adige and Piave. The Alps do not form an impassable barrier; they have been traversed for war and commerce, and later by pilgrims, students, and tourists. Crossing places by road, train or foot are called passes. These are depressions in the mountains to which a valley leads from the plains and hilly pre-mountainous zones. 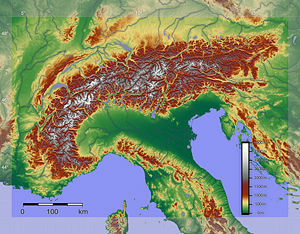 The "main chain of the Alps" follows the watershed from the Mediterranean Sea to the Wienerwald, passing over many of the highest and most famous peaks in the Alps. From the Colle di Cadibona to Col de Tende it runs westwards, before turning to the north-west and then, near the Colle della Maddalena, to the north. Upon reaching the Swiss border, the line of the main chain heads approximately east-north-east, a heading it follows until its end near Vienna. Several significant groups of mountains are separated from the main chain by sizable distances. Among these groups are the Dauphine Alps, the Eastern and Western Graians, the entire Bernese Alps, the Tödi, Albula and Silvretta groups, the Ortler and Adamello ranges, and the Dolomites of South Tyrol, not to speak of the lower Alps of Vorarlberg, Bavaria and Salzburg. While smaller groups within the Alps may be easily defined by the passes on either side, defining larger units can be problematic. A traditional divide exists between the Western Alps and the Eastern Alps, which uses the Splügen Pass (Italian: Passo dello Spluga) on the Swiss-Italian border, together with the Rhine to the north and Lake Como in the south as the defining features. While the Splügen Pass is neither the lowest nor the most important pass in the Alps, it is approximately half-way along the main chain, and makes a convenient boundary. Southern Limestone Alps, peaks up to 3,500 m.
The border between the Central Alps and the Southern Limestone Alps is the Periadriatic Seam. The Northern Limestone Alps are separated from the Central Eastern Alps by the Grauwacken Zone. south of a huge geologic fault ("alpine-dinaric seam") parts of the Dinarides. Within the Eastern Alps, the most widely used subdivision is the Alpenvereins-Einteilung, which divides the region into about seventy small areas. See Northern Calcareous Alps, Central Eastern Alps and Southern Calcareous Alps for details. The European Alps from space in 2002. 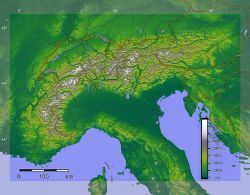 The Alps form a part of a Tertiary orogenic belt of mountain chains, called the Alpide belt, that stretches through southern Europe and Asia from the Atlantic all the way to the Himalayas. This belt of mountain chains was formed during the Alpine orogeny. A gap in these mountain chains in central Europe separates the Alps from the Carpathians off to the east. Orogeny took place continuously and tectonic subsidence is to blame for the gaps in between. The Alps arose as a result of the collision of the African and European tectonic plates, in which the western part of the Tethys Ocean, which was formerly in between these continents, disappeared. Enormous stress was exerted on sediments of the Tethys Ocean basin and its Mesozoic and early Cenozoic strata were pushed against the stable Eurasian landmass by the northward-moving African landmass. Most of this occurred during the Oligocene and Miocene epochs. The pressure formed great recumbent folds, or nappes, that rose out of what had become the Tethys Sea and pushed northward, often breaking and sliding one over the other to form gigantic thrust faults. Crystalline basement rocks, which are exposed in the higher central regions, are the rocks forming Mont Blanc, the Matterhorn, and high peaks in the Pennine Alps and Hohe Tauern. The landscape seen today is mostly formed by glaciation during the past two million years. At least five ice ages have done much to change the region, scooping out the lakes and rounding off the limestone hills along the northern border. Glaciers have been retreating during the past 10,000 years, leaving large granite erratics scattered in the forests in the region. As the last ice age ended, it is believed that the climate changed so rapidly that the glaciers retreated back into the mountains in a span of about 200 to 300 years. 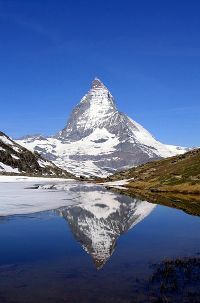 The Matterhorn, mirrored in Riffelsee. Little is known of the early dwellers in the Alps, save from the scanty accounts preserved by Roman and Greek historians and geographers. A few details have come down to us of the conquest of many of the Alpine tribes by Augustus. The successive emigration and occupation of the Alpine region by various Teutonic tribes from the fifth to the sixth centuries are known only in outline, because to them, as to the Frankish kings and emperors, the Alps offered a route to other places rather than a permanent residence. It is not until the final breakup of the Carolingian Empire in the tenth and eleventh centuries that it becomes possible to trace out the local history of the Alps. From this point, the history of the Alps region can be followed through the historical battles for power and control among the nations in the area. In the western Alps this includes the feudal lords of Savoy, the Dauphine and Provence. In 1349, the Dauphiné fell to France, while in 1388 the county of Nice passed from Provence to the house of Savoy, which also then held Piedmont as well as other lands on the Italian side. Central Alps history involves the formation of the Swiss Federation, while the political history of the Eastern Alps can be considered almost totally in terms of the advance or retreat of the house of Habsburg. The higher regions of the Alps were long left to the exclusive attention of the people of the adjoining valleys, even when Alpine travellers (as distinguished from Alpine climbers) began to visit these valleys. The two men who first explored the regions of ice and snow were H.B. de Saussure (1740-1799) in the Pennine Alps, and the Benedictine monk of Disentis, Placidus a Spescha (1752-1833), most of whose ascents were made before 1806, in the valleys at the sources of the Rhine. Swiss players of the "alphorn," a brass instrument played by the mountains dwellers. The central and eastern Alps are rich in traditions dating back to pre-Christian (pagan) times, with surviving elements amalgamated from Germanic, Gaulish (Gallo-Roman), and Raetian culture. Ancient customs survived in the rural parts of Austria, Switzerland, Bavaria, Slovenia, western Croatia and Friul in the form of dance, art, processions, rituals and games. The high regional diversity is a result of the mutual isolation of Alpine communities. In the Alps, the relationship between the Roman Catholic Church and paganism has been an ambivalent one. While some customs survived only in the remote valleys inaccessible to the church's influence, other customs were actively assimilated over the centuries. In light of the dwindling rural population of the Alps, many customs have evolved into more modern interpretations. The seasonal transfer of grazing cows (cattle-drive) to different pastures, known locally as Almabtrieb. Austrian city of Kufstein, 2005. The traditional economy of the Alps throughout history has been based upon rearing cattle involving seasonal migration between valley and high pastures. This practice has shaped a lot of landscape in the Alps, as without it, most areas below 2,000 meters would be forests. While tourism and industry contribute today much to Alpine economy, seasonal migration to high pastures is still practiced in Bavaria, Austria, Italy and Switzerland, except in their most frequented tourist centers. In some places, cattle are taken care of by local farmer families who move to higher places. In others, this job is for herdsmen who are employees of the cooperative owning the pastures. 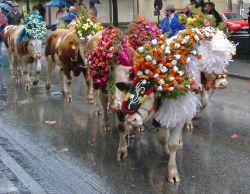 This practice contributes in a large way to traditional Alpine culture, as there are those who spend the winters isolated in the high pastures. 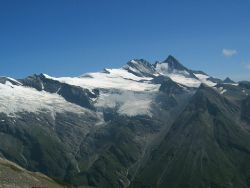 The Alps are popular both in summer and in winter as a destination for sightseeing and sports. Winter sports (alpine and nordic skiing, tobogganing, snowshoeing, ski tours) can be practiced in most regions from December to April, while in summer the Alps are popular with hikers, mountain bikers, para-gliders, mountaineers, while many lakes attract swimmers, sailors and surfers. The lower regions and larger towns of the Alps are well accessed by motorways and main roads, but higher passes and by-roads can be treacherous even in summer. Many passes are closed in winter. A multitude of airports around the Alps (and some within), as well as long-distance rail links from all neighboring countries, afford large numbers of travelers easy access from abroad. Alpenrose growing in the Austrian Alps. A natural vegetation limit with altitude is given by the presence of the chief deciduous trees—oak, beech, ash, and sycamore maple. These do not reach exactly to the same elevation, nor are they often found growing together; but their upper limit corresponds accurately enough to the change from a temperate to a colder climate that is further proved by a change in the wild herbaceous vegetation. This limit usually lies about 1,200 metres (3,940 ft) above the sea on the north side of the Alps, but on the southern slopes it often rises to 1,500 metres (4,920 ft), sometimes even to 1,700 metres (5,580 ft). This region is not always marked by the presence of the characteristic trees. Human interference has nearly exterminated them in many areas, and, except for the beech forests of the Austrian Alps, forests of deciduous trees are rarely found. In many districts where such woods once existed, they have been replaced by the Scots pine and Norway spruce, which are less sensitive to the ravages of goats, who are the worst enemies of such trees. The mean annual temperature of this region differs little from that of the British Islands; but climatic conditions are widely different. In the Alps, snow usually stays for several months, until spring and summer, which are considerably warmer on average than those seasons in Britain. 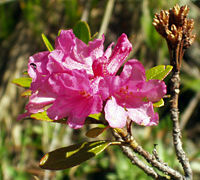 Above the forestry, there is often a band of short pine trees (Pinus mugo), which is in turn superseded by dwarf shrubs, typically Rhododendron ferrugineum (on acid soils) or Rhododendron hirsutum (on basic soils). Above this is the alpine meadow, and even higher, the vegetation becomes more and more sparse. At these higher altitudes, the plants tend to form isolated cushions. 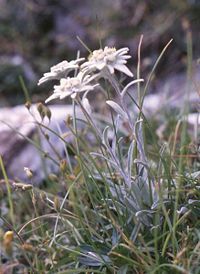 In the Alps, several species of flowering plants have been recorded above 4,000 metres (13,125 ft), including Ranunculus glacialis, Androsace alpina, and Saxifraga biflora. These images are of species common to the Alps. They are most numerously found in the 15 percent of the Alps protected in parks and reserves. Answers.com. Alps Retrieved April 25, 2008. Hurni, Hans. 2001. Special issue: the Alps in Europe and the Southern Alps in New Zealand. Mountain research and development, v. 21, no. 4. Berne: International Mountain Society. Schmidt, Elsa T. 2007. Alps Microsoft Encarta Online Encyclopedia. Retrieved April 25, 2008. All links retrieved March 9, 2016. This page was last modified on 8 March 2019, at 17:28.